Your details about the concrete are just mind-blowing. Here's Mercer -- the author of "Ancient Carpenter's Tools" and grandfather of the tool collecting world -- with concrete mullions and muntins. Hi Kari. Love your blog. 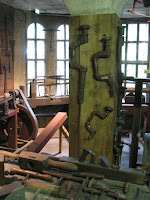 Wondering, though, if those tools in the first photo are really pre-Industrial Revolution. How is that defined? That box of molding planes look to be in fantastic shape. (pardon the pun). I saw a bunch on ebay recently that were horrible and were above a couple hundred bucks for about fifteen. Chris, Mercer must have really liked concrete---he even built his house with it! Joe, I wasn't able to find an exact date on the Mercer Museum website regarding the Industrial Revolution. It says that "Mercer recognized the need to collect and preserve the outmoded material of daily life in America before it was swept away by the Industrial Revolution." I found different dates on Wikipedia, some as late as 1850 (I thought it was more like 1880), referring to the Industrial Revolution. It is possible that some of the tools are post-IR, because the museum continued to collect tools after Mercer's death. There are over 50,000 pieces in the museum now. Thanks for bringing it up; I'll revise my post. Vic, you're right! The planes were in excellent shape. 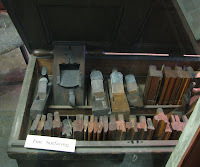 It seems like good user moulding planes are becoming a rarity. Man would I love to go there! But I'd have to bring a rag to wipe my nose prints off the glass! One thing I notice is that the focus seems to be on the tools themselves and not the use of the tools. From your pictures, the displays seem to be somewhat random groupings (excluding the planes in the chest - although I'm not sure I would include a match plane in "fine surfacing") Were there any displays set up with groups of tools in more realistic groupings/settings? Like a workbench where the user just stepped away. I think that would be interesting and educational. What kind of pieces were suspended in mid-air? Thanks for the post – yet another place to add to my list! Dan, I noticed that about the tools —they are placed randomly. And you really can't get any closer to them than what you see in the photos. From what I remember, there is a fishing boat, cradles, chairs, and a grinding wheel hanging in the atrium. There is so much to see, it's hard to remember everything. One of my favorite museums (relic hall, menagerie, etc. ), with an interesting collection. In the first photograph is one of the finest braces I have ever seen. I had made one similar prior to visiting and when I saw this one, I sold the other one with the intentions of making a copy of the one with angled jointed sweep. Is it open in the winter? When I visited, I got a cooks tour, it was in December and the place was freezing. I must have shot 6 or 7 rolls of film in there. Stephen, the museum is open all year round and you're right about the chill. You might want to bring a jacket with you even in summer. Concrete is cold! Mitchell, I liked that tool, too. It caught my eye right away. I believe it is a handmade cooper's adze, used for hollowing shallow curves like in bowls and troughs. In the photo, you can see the back of the blade, which is only about 1/2" wide. The tops of the tangs, which slide beneath the metal straps that are attached with screws, can be tapped lightly with a hammer, thus lowering the blade and increasing the depth of cut.